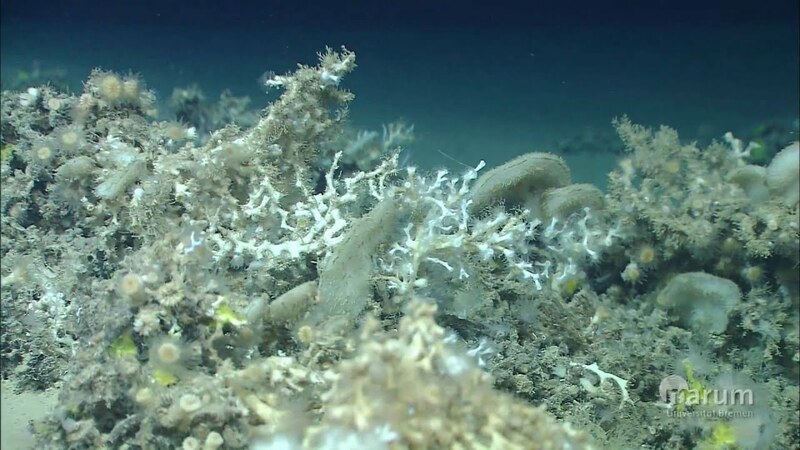 It may be the last place you'd expect to find corals -- up to 6,000 m (20,000 ft) below the ocean's surface, where the water is icy cold and the light dim or absent. Yet believe it or not, lush coral gardens thrive here. In fact, scientists have discovered nearly as many species of deep-sea corals (also known as cold-water corals) as shallow-water species... deep-sea corals don't need sunlight. They obtain the energy and nutrients they need to survive by trapping tiny organisms in passing currents... living even in waters as cold as -1ºC (30.2ºF)... occur in the waters of the United Kingdom, Australia, New Zealand, Canada, Ecuador, Japan, Norway, and the United States. Scientists have even found deep-sea corals off the coast of Antarctica. They grow in all the world's ocean basins, where they form deep-water havens on continental shelves and slopes, in ocean canyons, and on tall seamounts... more than 3,300 species of deep-sea corals have been identified. And the numbers keep climbing... one particular colony of gold coral (Gerardia sp.) found off the coast of Hawaii was about 2,742 years old. Marine researchers determined that another deep-sea coral colony in Hawaii -- this one a black coral (Leiopathes sp.) -- was about 4,265 years old. These coral colonies are the oldest marine organisms on record. Due to the continuous regeneration of new polyps, some deep-sea coral reefs have been actively growing for as long as 40,000 years... colors -- yellow, orange, red, purple, and more... reefs that stretch for 40 km (25 mi). Te article is apparently written by know nothing environmental wackos who have no understanding of the nature of corals. Their mantra is more about destroying the livelihood of third world jewelry craftsmen than about saving the reefs. The protected reefs in Key West are virtual wastelands whereas the vast reef system of the Caribbean is flourishing, especially in countries like Haiti where a craft industry of coral artisans are working creating magnificent works of art. When I was stationed in Italy, I discovered that WWII had given us a real treat - many of the old bomb craters along the beaches had grown all sorts of colorful coral. Had to be careful snorkeling along the area because sometimes there was 2' or less of water between you and the "normal" coral, which could give nasty cuts, but then it would open up into a 20' wide and 10' or so deep crater with some of the most beautiful coral I ever saw.